Diesel has a home! - Rocky Mountain Great Dane Rescue, Inc.
Diesel has a home with his foster family in Littleton, CO. Dawn and her husband Dustan have long wanted a Great Dane. Many years back they had a Golden Chow Mix, and more recently have only had little dogs in their home. They both really missed having a large dog in their home so they decided to apply and rescue a Great Dane! 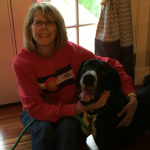 Dawn works in a vets office and over the years has seen many Giant Breeds come into the office, between missing the big dog presence in her home and seeing them in her office, she knew it was time. Diesel came to her as a foster and she couldn’t bare to see him leave. He made himself right at home with Dawn and Dustan and their other little fur kids TedE & Ms Chief. We couldn’t be happier for the whole family! Way to go Diesel!